How many of you are leaders?" asks Sallyann Della Casa. A simple question but, predictably enough, not a hand goes up among the 25 students in Grade five of the International Indian High School in Dubai Silicon Oasis. Sallyann was expecting this reaction and moves on to the next question: "How many of you believe you are not a leader?" This time almost all of them raise their hands. "OK, now you tell me what are you good at?" Sallyann asks the child nearest to her. "Maths and English," says the boy. "So, are you a leader in those subjects?" "Why did you raise your hand then? You are a leader!" she says with a smile. She moves on to the next kid, who says he's good at sport. "That means you are a leader too,'' she says, as she moves on to the next student. "You are all good at something, so you are all leaders!" she announces. The kids are beaming by now, and participating enthusiastically. At the end of the 45-minute exercise the children have learnt to be confident about their abilities, and each one of them believes he or she is a leader. 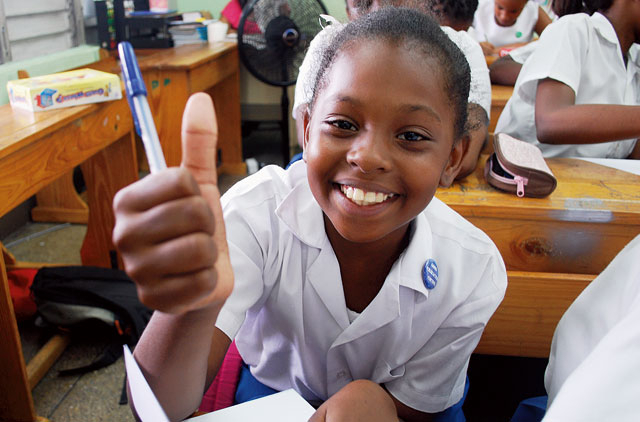 They give the thumbs-up sign to Sallyann to prove their individuality and leadership qualities. Strike one for Sallyann. As Dreamer-in-Chief and Lead Tree Shaker - yes, that's the title on her card - of The Growing Leaders Foundation, a not-for-profit organisation based in Trinidad and Tobago, Sallyann's presence in Dubai is partly due to the fact that her husband, Paolo Della Casa, a businessman, is currently based here. But more than that, Robin Sharma, the motivational guru whose techniques Sallyann has adapted for children, encouraged her to bring her programme to the Middle East. Sallyann first revealed her compassionate side at the age of three, when she asked her parents to help get poor children in her class a meal. As a teenager, she volunteered her time with various NGOs. And today she is a qualified lawyer who speaks four languages - Italian, Spanish, French and English - and also has a love for urban planning and development. But her real passion is motivating children. In 2004, she volunteered to teach and create new supplemental material for Kids and the Power of Work (KAPOW), a programme administered by the US National Child Labor Committee. The project involves volunteers teaching career awareness to elementary school students through professionally developed lessons. At the age of 35, in 2009, Sallyann set up Growing Leaders after she finally ‘heard her song' and found the courage to start dancing to it. "Every day now I know exactly how I can touch another human being, with my story or with the work I do," she says. "Just imagine if you could tap into this gift in every child right now? Imagine if you ‘knew' right from a young age a sure sense of self, why you are here and what your gifts and talents are, without being influenced. That's what leadership means." And that's why she wants to spread her message to children all over the world. "We hear over and over again that education is the way out," says Sallyann. "That is true and I believe every human being deserves the opportunity to learn to read, write and exercise the muscles of their minds, since that is what education does. But education is not the only way one becomes a great leader." She uses the examples of Steve Jobs and Mother Teresa - great leaders in their fields who have had a major impact on the world. "It was not education that made them great, it was fundamentally their ability to dream bigger than anyone else and then find the courage within themselves to walk towards their dream, knowing and having faith in their unique gifts and ability to make it happen. That is a whole side of the brain we are simply not exercising in our young people. Getting them to use that facet of their brain is what will help them become leaders in life." Going by the reactions at the schools where Sallyann held demo workshops, the UAE appears to be eager to imbibe her lessons. "She made each child feel special," says Chitra Sharma, principal of the JSS Private School in Dubai. "We saw a marked difference in the way the children felt about themselves after the workshop. Especially one child, who listed ‘quiet' as one of his negative features when asked to list the reasons why he didn't consider himself a leader. She told him that he was a ‘quiet leader'. After the session we noticed him walking tall, quietly confident. We feel this programme will help the children realise their true potential." It was not just the students who benefited from the programme. Teachers felt a sense of release and gained new insights. "It was a very stimulating exercise," says Geetha Murali, principal, International Indian High School, Dubai, who sat through a session with her school's fifth-graders. "There's no doubt about its effectiveness and the ease with which the programme connects with the children and makes them aware of their leadership qualities. Along with them, we adults also got to look within ourselves, and identify our own emotions when we were asked to describe ourselves. We got to know ourselves better." Nadine Tarazi, principal of Sharjah American International School, Dubai campus, feels the programme is a timely idea. "There's a great need for such leadership workshops for children," she says. Sallyann's programme was well-received as a confidence-building, motivational tool. Children - and teachers - appeared to grasp the fact that they could embrace their good qualities and become leaders in their own way, not necessarily the way parents or society wanted them to. "We are taught, especially in developing countries, that we can only look up to those people who have a degree. But how many leaders are degree-holders? We are taught that the majority of successful people in the world are doctors, lawyers or other professionals, but the truth is that only a few really make it. And when you talk about making a difference in the world, yes those careers are admirable historically, but the stand-outs, again, are actually very few and far between." As a child of a very traditional Indian family in Trinidad - her mother was a homemaker and her father a businessman - Sallyann was sent to boarding school in Switzerland at 11, then went on to acquire a law degree from the University of Miami and a Master's in urban planning and development from the University of St Thomas, Minnesota. She then practised law for eight years in Miami. "I lived the life that was expected of me," says Sallyann. But things were changing within her, and Sallyann was smart enough to recognise the nagging sense of dissatisfaction that had crept into her charmed existence. "It's easy to recognise our gifts as a child, but very few of us are encouraged in that direction. I had a very vivid imagination, and now in my thirties I am discovering what a creative person I am. Now, every day, when I hear or learn about something, I can visualise the idea and come up with new ways of conveying it to people." That gave her the impetus to volunteer for KAPOW. But even there, Sallyann charted her own course. "I found that the curriculum was developed in 1984, so the kids were no longer connecting to the activities because many of them were dated," she says. She started re-writing the curriculum and incorporating it in her classes on her own. "The person in charge of the programme, which is part of the National Child Labor Committee, sat through my class once while on a visit, and was surprised it was not in the curriculum. I told her the old curriculum was no longer applicable, and she wanted to incorporate my methods into the regular curriculum. That's when I realised that I knew how to write a programme." Eventually she gave up law to focus on her brand of education. It was about five years ago that Sallyann read Robin Sharma's bestseller The Greatness Guide. "It was Robin who first introduced me, through his book, to the concept of growing leaders, which is now the name of my foundation," she says. 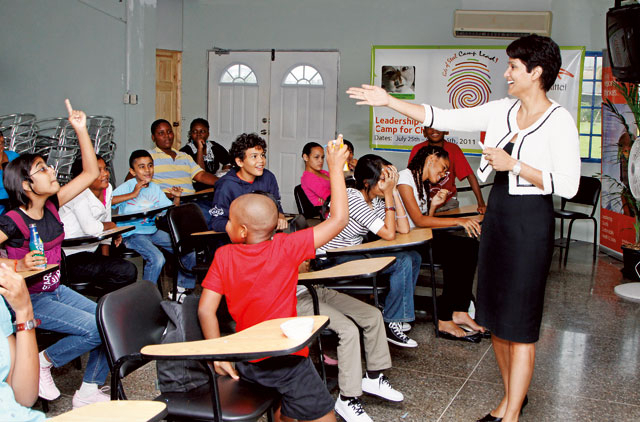 That is what spurred her to incorporate leadership lessons into the KAPOW curriculum. When her father passed away three years ago Sallyann moved back to Trinidad from the US and started The Growing Leaders Foundation a few months later. She wanted to put into practice what she'd learnt volunteering in the US together with her own adaptation of Robin Sharma's principles. She decided to target eight to 12-year-old children, as they are considered the most vulnerable, and suggestive to change. 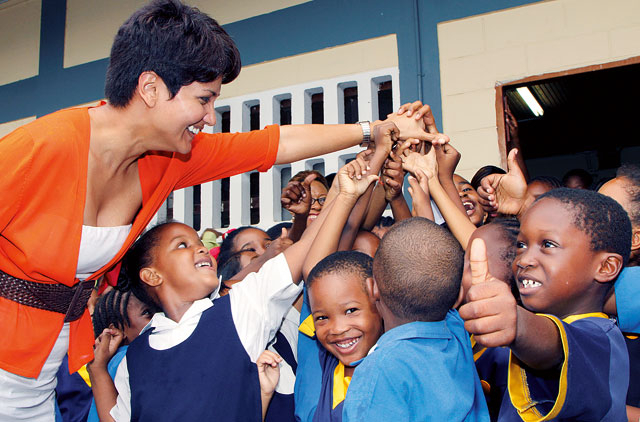 "I got in touch with the principal of the largest school in Trinidad, the San Fernando Trinidad Muslim League School, who allowed me to start the programme in her school," she says. "Because they were the number-one school there, when all the other schools heard about our leadership programme it opened the floodgates and within a couple of months we had a waiting list of schools." The core leadership curriculum takes the form of 12 hour-long sessions hosted by volunteer mentors. For a while, classrooms become spaces where children ask and answer life's fundamental questions: Who am I? Why am I here? What are my natural gifts and talents? What are my weaknesses? What do I want for my life? "What I am doing is supplementing the education system by giving children the tools for a future that is uncertain," says Sallyann. "It's the basics: a sense of self, a sense of purpose, things like teamwork, open-mindedness and the power of connection. "We bring in ‘ambassadors' - people from the children's own country who are doing great things all over the world. The power of that, for a child in a village, to see someone who sounds and looks like them, doing something great across the globe immediately opens up their vision. They can realise that their circumstances will not determine who they are going to be. Thus, you immediately open up possibilities for them. Which is where I am coming from - building stronger minds." When it came to imparting the education, Sallyann decided to leverage the power of those in the private sector to implement the programmes in schools. "Corporate Social Responsibility (CSR) is a growing area," says Sallyann. "It stems from the global trend of employees wanting to know how, if they work for a particular company, will it help them to change the world in some way. And, even though there is need for one-off CSR volunteer projects such as visiting a orphanage or cleaning up a beach, let's be honest, the visits are often only a short-term feel-good patch. I target the major corporate players and dare them to grow leaders with me." Sallyann discovered through the US model that youths actually open up and share more with a complete stranger in one hour, using her leadership curriculum as the bridge, than they would with their own teacher, where there are preestablished rules and dynamics. "So we train corporate employees to teach our curriculum and then they teach in a school one hour a month for an academic year," she says. It may seem like very little time, but Sallyann says they've tested many kids over the past few years and after just six hours of sessions their leadership ability improves by 19 per cent. Sallyann chooses companies that are serious about CSR and helping the young. "We have some major corporates such as Morgan Stanley and American Airlines, among others, who have had their employees conducting the programmes in schools," she says. "They have told us that the benefits come back ten-fold to them in terms of improved teamwork, performance, leadership skills, strengthening loyalty to the brand and so on. And the employees range from factory floor workers to the management team." Sallyann says it's a win-win situation for everybody. "By having employees teach our leadership workshops in the fun way it is written, with teachers present but sitting at the back of the classroom, the employees and teachers are also learning about their own untapped leadership abilities," she says. "They cannot help but be impacted also. As a result we now also have many teachers coming to us for leadership training. "Over the past two and half years we have been helping to inspire 39,000 children," says Sallyann. "Every month we add on another 100 children to the programme." The Growing Leaders Foundation's unique selling point is Robin Sharma, who agreed to lend his name to the organisation that was putting his ideas into practice. "I invited Robin Sharma and he was gracious enough to acknowledge our work and agree to support us. We now have a joint venture with Robin Sharma where we develop his Lead Without Title themes within our youth leadership curriculums," says Sallyann. It also gave her the impetus not to rely on donations to grow the programme. "We are a not-for-profit organisation, but we do not accept donations," she says. "Instead, we are funded by the ads that we receive for our magazine Lead Up, our monthly youth leadership publication, which is circulated to all schools. It is distributed to schools directly and also comes out once a month through the leading local publication in the regions where we are mobilising." 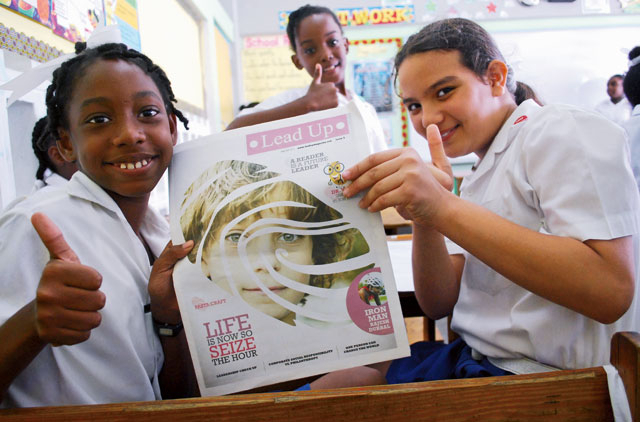 Companies are only able to advertise in Lead Up with quarterly commitments but are eager to do them in order to communicate to the magazine's audience of young future leaders how their activities in CSR are impacting the world. Sallyann is now ready to take on the Middle East and slowly expand into Asia. She's already found a partner to distribute Lead Up in this region - Gulf News. She's in talks with the Knowledge and Human Development Authority (KHDA) in Dubai, and Mubadala - an Abu Dhabi government arm for facilitating diversification of Abu Dhabi's economy - about including leadership programmes in the curriculum. She's conducted a series of workshops in several schools including Al Sadiq School, Pristine Private School, The Indian High School and The Central School. "The response has been fantastic, and most principals want the programme," says Sallyann. What keeps her going is this vision: "Just imagine a world where we had the courage to stand up and say ‘this is who I am', and know that from the core of your being this is what you are going to do and this is what you are leaving to the world. When you know that, you start looking at the big picture."